New Zealand's Prime Minister Jacinda Ardern leaves after the Friday prayers at Hagley Park outside Al-Noor mosque in Christchurch. 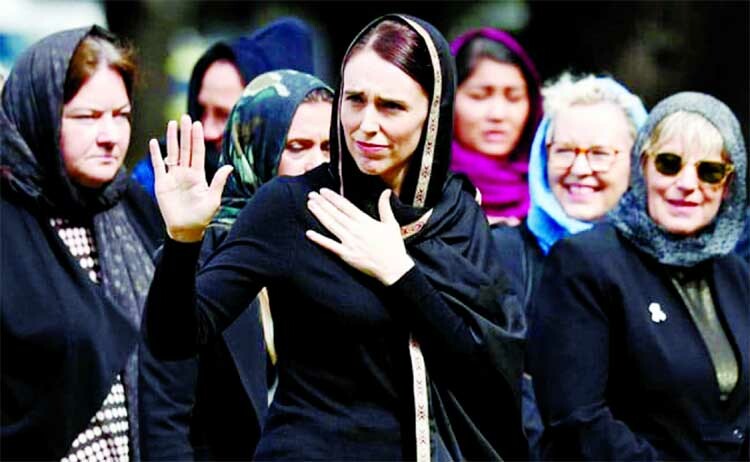 Prime Minister Jacinda Ardern joined about 20,000 people standing quietly at Hagley Park, in front of the Al Noor mosque where most of the victims were killed during Friday prayers last week. "New Zealand mourns with you. We are one," she said in a short speech, followed by two minutes of silence. human chains in front of mosques. Others said silent prayers at schools, cafes and even offices. Relatives and other mourners thronged into a Christchurch cemetery where 26 victims of the attack, and one person who died in a car crash that was unrelated to the mosque shooting, were laid to rest in a mass burial. "This is a special janazah. We don't do these every day," one mourner said over a microphone, referring to an Islamic funeral prayer. "We don't bury 27 of our brothers and sisters every day." The first to be laid to rest was Naeem Rashid, who was hailed as a hero, killed trying to tackle the gunman at the Al Noor mosque. Ardern, surrounded by ministers and security officials at Hagley Park, wore a black headscarf and a black suit. Female police at the park also wore headscarves, with a red rose on their uniforms. In a powerful speech that lasted about 20 minutes, the imam, Fouda, said through its love and compassion, New Zealand was unbreakable. "We are here in our hundreds and thousands unified for one purpose - that hate will be undone, and love will redeem us," he said. He thanked Ardern for her compassion, saying: "It has been a lesson for world leaders." Fouda also denounced Islamophobia, saying it had killed people. "Islamophobia is real. It is a targeted campaign to influence people to dehumanize and irrationally fear Muslims. To fear what we wear, to fear the choice of food we eat, to fear the way we pray and to fear the way we practice our faith," he said. Muslims account for just over 1 percent of New Zealand's population. Many women wore headscarves in New Zealand as a sign of support to the community, and a #headscarfforharmony movement was trending on Twitter. "We are wearing headscarves showing our support, love and solidarity, and hope that by everybody doing this it will demonstrate to Muslim women ... that they are one with us," said Robyn Molony, 65, with a group of friends wearing headscarves at Hagley Park. Residents of Christchurch are still recovering from a devastating earthquake that hit in 2011, killing 185 and injuring thousands. "Since the earthquakes, we've gone through a lot as a city and we're a lot more caring and looking out for one another," said James Sheehan, 62.